Jean Patou Collection Héritage (i.e., reformulated) Patou Pour Homme1 arrived on my doorstep (invited) last week. Patou Pour Homme, Jr., may have been shocked, and intimidated, to learn that years ago I was physically involved with his father, Patou Pour Homme, Sr., who used to cling to me from neck to stomach and points south. I can't remember how long ago it was that I owned a bottle of original Patou Pour Homme2 (it was released in 1980), but I bought it around the same time I purchased Patou Pour Homme Privé, which came out in 1994. I have not smelled original Patou Pour Homme in ages, but I remember it as a dense and sumptuous perfume — you could really feel its embrace of spices, resins, musk, and power-hits of gorgeous sandalwood and oakmoss. I wore original Patou Pour Homme in Los Angeles, where the warm temperatures made me reserve it for cool nights and "winter" wear. When I first put on Collection Héritage Patou Pour Homme last week, a flood of scent memories came back to me, even as I realized this new formulation is different — lighter and gayer (happier feeling, yes, but less "straight" too). Original Patou Pour Homme always made me feel immature (needed more chest hair), underdressed (I was too California casual), and a bit frivolous (shouldn't I get an M.B.A.?) New Patou Pour Homme suits me better. Collection Héritage Patou Pour Homme goes on smelling mossy and slightly smoky with a strong citrus backdrop. A large dose of creamy and musky galbanum comes to the fore and...then the perfume vanishes momentarily — the olfactory equivalent of snuffing out a candle. After a minute of "silence" (what a neat effect), Collection Héritage Patou Pour Homme starts pulsating and sending out wafts of sweetish, leather-tinged incense, peppery and floral (but floral in an indistinct way); the heart notes smell slightly medicinal, but "food-y medicinal" — like a syrup or pastille you'd look forward to tasting. As Collection Héritage Patou Pour Homme enters its final phase, it presents one of the best violet leaf notes I've ever smelled, not artificial or loud or "contemporary," but natural smelling. Though moss is supposedly absent from new Patou Pour Homme, perfumer Thomas Fontaine did find a way to create the aura of true oakmoss (less dense than original Patou Pour Homme's moss, and that's a positive development for me). Collection Héritage Patou Pour Homme ends with a lovely, balmy, slightly talc-y wood-and-ambergris accord. New Patou Pour Homme has just-right sillage and good lasting power; it's more masculine than unisex to my nose. As you can probably tell, I want a "long-term relationship" with Patou Pour Homme, Jr., but there's a problem: he's expensive and a bit more than I can handle (there's only a 100 ml option, about 50 ml more than I desire). Now, if Jean Patou sees fit to re-release my all-time favorite Patou scent for men, Patou Pour Homme Privé, and it smells like the original...I'll pay the price and take what I can get. 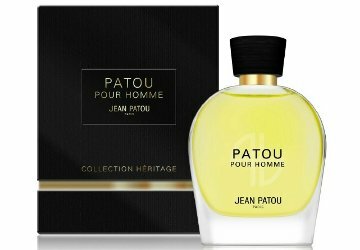 Jean Patou Collection Héritage Patou pour Homme is available in 100 ml Eau de Toilette, $245. 1. Thomas Fontaine, perfumer; listed notes of bergamot, lemon, galbanum, pepper, rose, jasmine, lavender, tarragon, sage, violet leaf, leather, patchouli, olibanum, ambergris. 2. Jean Kerléo, perfumer; listed notes of bergamot, pepper ("hot" and black pepper), lavender, tarragon, sage, galbanum, vetiver, cedar, patchouli, cistus labdanum, sandalwood, oakmoss. 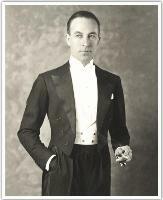 Note: image of Jean Patou from the Jean Patou website. Ah, PPH ‘Sr.’ was my signature scent of the 80’s. I have a couple of decants of it and paid way too much for 40% full chipped bottle of it off the bay. Nothing else is like it, and I am too scared to wear it frequently in fear of running out. Was hoping that the local NM would have the new version, but alas my last few times visiting the store has been unfruitful. I should just order a decant, but as you pointed out, it is really expensive, and I remember paying less than $100 back in the day for the original. I have a decant of the Prive, love it too, all that green lavender. relleric: pricing is crazy for Sr. Patou Pour Homme…just glanced at eBay and one bottle is up for $600! I’ve never smelled a scent I’d pay that much for! But DO USE your beloved Patou…it’ll disappear, yes, but so do we all! HA! Thanks for your great review, I want to try it more than ever now! This sounds fabulous, and I’ll try it regardless of its masculine leanings! But my God, when will this industry understand that we don’t need vats of everything?? What do you mean my gayer/less straight? I’m curious as to how orientation plays into scents? JolieFleur…Gay & Straight Perfumes(TM). I’ll get working on it ASAP! I think many “special” reissues and limited editions are available in 100 ml ONLY to push purchasing…”it’s this…or nothing!” I can resist that though…. Jolie: PS — I really didn’t mean “gay” and “straight” in the sexual/ orientation sense…old Potou Pour Homme was “straight” in that it seemed “mature” “responsible” “serious” compared to this lighter, new formulation. Still…a great idea for a post. Loved the review and this sounds like a pure winner. I want my hubby to smell like this, is he worth the price? I think yes. Would he? No. Kelly Red: yes, 50 ml would have been great…hateful! This sounds beautiful! Too bad about the price and size, though I guess maybe being able to reply “Patou” when asked what your wearing is worth it. Glad whoever owns Patou are continuing on the Patou name gracefully. Also I finallyI smelled and tried Zegna Haitian Vetiver and loved it! Yet it’s another one that I only need half the bottle at half the price! The only Patou I have ever tried is Joy, and it was not love. But, given this review, and another of 1000 I’m definitely thinking I need to amend that! Merlin: there are some beautiful Patous! 1000 is one of them. I found a bottle of 1000 parfum in an antique store here with a little of the oil left in it, this stuff is gorgeous. I have no idea how old it is, but my guess is somewhat vintage since the title has quotes around it on the front of the bottle. Would love to score some more of this but when I went looking for it, it was quite spendy. NM used to have it on their website but I don’t see the parfum listed any longer, so will have to try my luck on eBay. relleric: yep…you have to be in the right place at the right time to score old 1000 at a good price. The “new” 1000 is beautiful too though. Ach — yet another scent to add to my must-sample list! It sounds heavenly, and I can never really have enough violet leaf in my life. And Patou love seems to run in my family. 1000 was my mother’s favorite perfume, and I’m currently wallowing in animal happiness with a bottle of vintage Joy. Great review as always, Kevin. You always leave me laughing! It seems there are enough people here who want some of this that you all ought to organize a split. Great and funny review, Kevin. I think these big bottles are also meant to turn away middle class folk like myself, creating an aura of exclusivity, as was the case with the early Chanel exclusifs. Needless to say, this is such an unfriendly, rude and just plain stupid way for a brand to relate to its consumers. If the industry wants people to get into perfume again, and considering the current rate of releases, 30 ml bottles are the way to go. And see, I have no MBA! Totally seconding the idea of the gay & straight frags post. Solanace: perfume marketing often leaves me scratching my head…it often ignores classic marketing basics (as if to discourage purchases…which I can’t believe is the purpose). Never underestimate the power of stupidity.